For the ultimate in romance and relaxation, choose a Curaçao honeymoon for your trip of a lifetime. On a Curaçao honeymoon, you can drive through hidden coves and cliffs, revealing beauty and wonder at each turn. Find yourself drawing a blank wondering where Curaçao is on the map, consider this: it’s the ‘C’ of the ABC islands in the Caribbean. They are the westernmost of the Leeward Antilles, north of Venezuela. Here, you have Aruba, Bonaire and as the alphabet predicts, Curaçao! This Dutch-Caribbean destination is renowned for some of the most beautiful beaches not only in the area, but on the planet. So, if you love exclusive beaches and warm weather, then we think you’ll love a Curaçao honeymoon for your just-hitched getaway. Here’s everything you need to know before you book your Curaçao honeymoon. 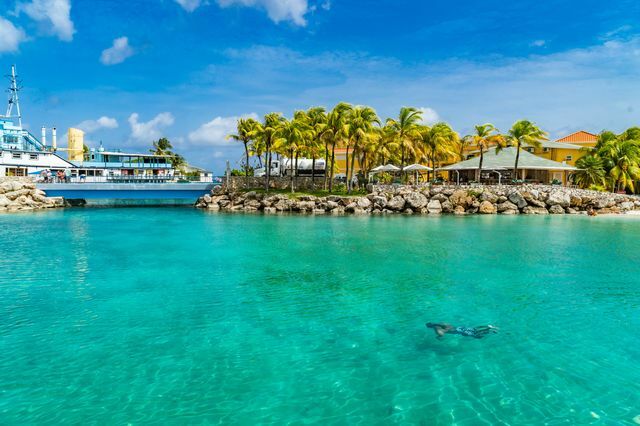 If you become easily frustrated with crowds, you’ll want to choose to take a Curaçao honeymoon during the off-season, which runs from May to November. You’ll find much more affordable hotel rates and more room for your sunbathing tush on the beach. If you happen to travel during the winter—December to April—be prepared for a bit more chaos. Spend a day touring Willemstad: If you’ve ever been to Copenhagen, you’ll feel like you’re back in Denmark when you catch a glimpse of the colorful ‘skyline’ of Willemstad. This capital is a UNESCO World Heritage City, and is divided into two parts, separated by the Queen Emma Bridge. The tourist area is mainly in Punda, with most travelers loving the waterfront promenade of Handelskade with shops, restaurants and more. Explore Hato Cage: Fun fact: during the Ice Age (yep, millions of years ago), these caves were created due to dropping water levels. Now you can see the wild masterpiece with underground pools, waterfalls, statues and limestone platforms. Keep an eye out for bats! Meet Ostriches: If you can take a selfie with an Ostrich, why wouldn’t you? Fifteen minutes from Willemstad is the Curaçao Ostrich Farm, offering affordable safaris where you can learn about these interesting creatures, and of course, pet one. Hike Through Christoffelpark: As the largest national park of the country, you can expect countless species of birds and plants, as well as fauna and plenty of flowers. If you’re lucky, you might even spot rare animals in the wild, including the barn owl and the white-tailed deer. Most travelers attempt to climb the 1,150-foot Christoffel Mountain, offering 360-degree views of the sea, city and beyond. Spend An Afternoon at Playa Abou: This beach is a favorite of locals, so make sure to get there early to snag a spot. Here, you can expect beautiful blue waters, and opportunities to snorkel to remarkable coral during your Curaçao honeymoon. Go Cliff Jumping at Playa Abou: If you dare, this is the spot to go cliff jumping in the country. Though they aren’t too high—20 feet—make sure to watch the locals as they know the right way to jump to avoid danger. Go to the Suplado Blow Hole: You might have thought blow holes were just for cartoons, but think again. By off-roading your way to Westpunt, you can see a real blow hole in action—and hey, you might even get sprayed in the face! Eat Iguana: As you drive through Curaçao, you’ll be amazed by the number of goat and iguana that parade the streets. These are considered dishes in this country, tempting travelers to test their taste buds. It might not be your kind of dish, but it’s worth trying it since you’re in the area. Wash it down with their legendary green rum, too! Visit a Truki Pan: This translates directly to ‘bread truck’ in the native language of Papiamentu. Locals love these, especially before or after a night of dancing. You can find everything from breakfast-inspired goods to sandwiches and beyond. Snorkel the Blue Room Cave: If you and your partner are scuba certified or you enjoy snorkeling, you can’t leave your Curaçao honeymoon without going to to the Blue Room Cave. You’ll need to hire a guide, but it’s the most famous area of the country, offering you an unbelievable underwater cave to explore.